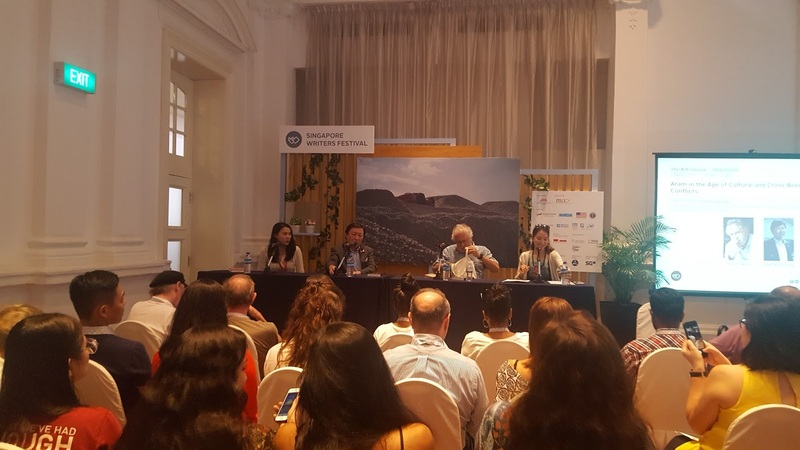 The panel entitled Aram in the Age of Cultural and Cross-Border Conflicts, moderated by TV presenter Greta Georges, opened to a room so packed, it was standing three-deep in the back. But the panel appeared to have gotten mired in the thicket of translation of the meaning of 'Aram'. Using the English translation of Aram as 'the good life', the panelists Héctor Abad, Koh Buck Song, and Suki Kim, whose credentials range from human rights memoirist (Abad), literary editor, non-fiction writer of 30 books and poet (Koh) to undercover investigative journalism (Kim) tackled it from three countries’ perspectives – Colombia, Singapore and North Korea, respectively. Abad took it to mean ‘political peace’ in a country riven until very recently with conflicts, American-fueled cocaine wars, kidnappings and assassinations (Abad’s own father was killed which is the subject of his memoir). Koh likened it to the serenity enjoyed by Singaporeans, the so-called ‘paradise on earth’ because of the government’s ‘extreme vetting’ in immigration policy and cultural management of racial harmony. Suki Kim challenged its meaning within the context of North Korea: where there is no freedom and no contact with the outside world, can there be a good life? However, as a member of the audience clarified, Aram encapsulates more accurately a meaning of ‘how to live a virtuous life’, which is different from ‘a good life’. It isn’t necessarily the American trope of ‘life, liberty and the pursuit of happiness.’ It isn’t that sense of serenity, false or not, provided by a paternalistic government. Nor is it even the basic human rights we expect to be given – a freedom to speak, to pursue one’s political beliefs – in the face of political persecution. As Kim said, “there may be a lack of the good life, but there is joy.” What is joy and how is it related to living a virtuous life? Can it even be possible if human nature, as Koh seems to believe, is inherently self-interested, that the most we can aspire to is ‘enlightened self-interest’? Or as implied within the statements by the panelists and moderator, one needs to have a certain level of security (financial, political etc.) before one can look beyond oneself. Beyond the slippage of translation is thus a more fundamental philosophical question of morality and human nature, whether you believe human nature to be inherently good or bad, and whether morality even means anything or can be exercised in a world without freedom. Another striking revelation is that the political infiltrates the personal at many junctures: from our sense of morality, our ideas of freedom, to issues regarding plain economic survival. For many of us, Western philosophy has dominated (to the occlusion of Eastern concepts) our ideas of inalienable natural rights, morality and conscience, human nature –animal or not, the role of government and the social contract, and these discussions expose the hidden assumptions we hold, schooled as we were by Locke, Kant, Rousseau, Hegel and Nietzsche, but the concept of Aram is perhaps not beholden to any of these. Do we once again fall into that sinkhole of East-West divide? If we were to delve more deeply into the etymology and origins of this ancient word Aram, or its central thematic focus in Thirukkural, written by Tamil poet and philosopher Thiruvalluvar sometime between the third and first century BC, or even within its more contemporary elasticity and contextual prevalence within Tamil literature, might we perhaps come to a different, more layered understanding of how to do good? These are important questions to ask in a world of increasing conflict and cross-border issues as the balance of powers shifts: what does ‘doing good’ mean to any given individual? What do I need (or do I even need anything) before I can do good? 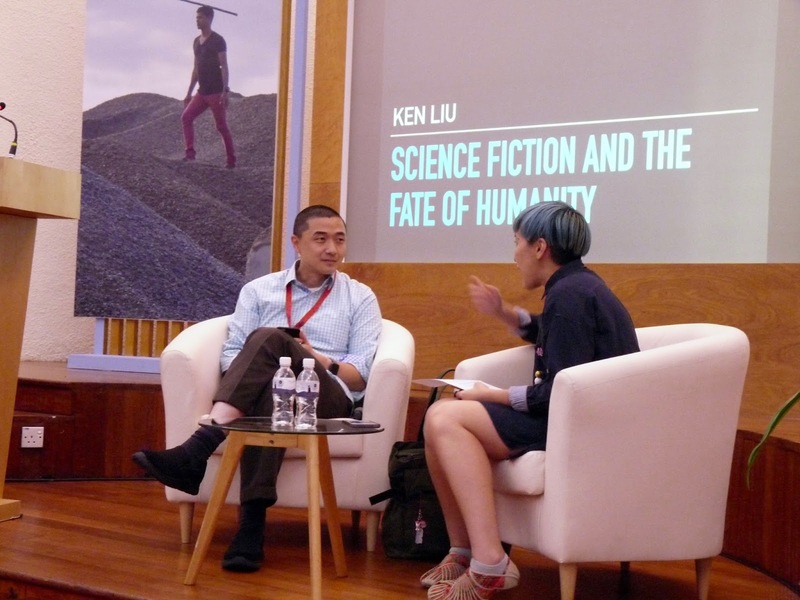 In Ken Liu’s lecture When Fiction Becomes Fact: Sci-Fi and The Fate of Humanity, Liu explores the function and importance (or lack thereof) of science fiction as a predictor of the fate of humanity. As he eloquently argues through examples of many different technologies (the touch-screen, the computer, the web, the Model T-Ford, the vacuum cleaner), science fiction is a horrible predictor of the advent of real technology and makes manifest the myth of the ‘eureka moment’ – technology is rarely one individual stroke of genius but in fact the result of many different attempts by many different individuals, or teams, trying to make a breakthrough, after which, that technology seems inevitable, the only possible path. So, if science fiction is so bad at becoming fact, why read science fiction? Liu believes that the most compelling stories in science fiction are about collective decision-making and its ramifications and will for the future. He argues for the relevance of science fiction (in all its dystopian glory) in supplying us with a vocabulary and lexicon (ideas such as Big Brother, doublethink, thought crime, memory hole, newspeak have now become endemic) with which to address and engage in discussions of how we should begin to think about our future. As he so pithily said, science fiction is about ‘making’ the future, not predicting it; the triumph of Aldous Huxley’s Brave New World is precisely that the world it forecasted never came to be. Well, as it pertains to Orwell's 1984, I'm not quite so sure. Details: The Singapore Writers Festival runs from 3rd to 12th November. Tickets are still available at the festival.